It all starts with an outstretched hand. As the protagonist, Max Caulfield, reaches out to stop the killing of an unknown girl by a raging maniac, she discovers she has power to reverse time, which she uses with little hesitation to save the life of the girl. This instance is predictive of the path Life is Strange takes; heavy scientific subjects are mostly props in a narrative that focuses on the humanistic aspect. The game has an apt title – this is a tale about the complexities of life, not science. Max is a teen student at a prestigious art school, Blackwell Academy, in the quintessential small-town-with-a-secret, Arcadia Bay. A photography geek and social outlier, her teen troubles are quickly outclassed by apocalyptic visions and her new-found power. Through an improbable series of events, Max is reunited with her childhood best friend, Chloe a.k.a the girl whose life she unwittingly saved. As they rekindle their friendship, the duo tread increasingly murky depths in attempting to clarify the intricate conspiracies plaguing Blackwell and Arcadia Bay. Life is Strange sets itself up as a fantastical mystery, but it is, at its core, a coming-of-age story. The five episodes of the game span a week in-game, a week that forces young Max to grapple with life-altering experiences and decisions, emotional trauma and the trials of someone on the fringes of adulthood. The beauty of Life is Strange’s narrative is the organic introduction of these complex themes into the story. 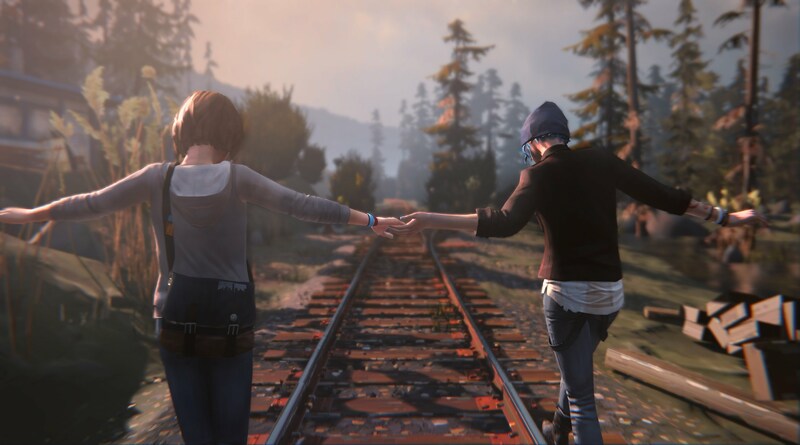 Max’s relationship with Chloe explores loss, abandonment, and as the game progresses, a renewed faith and optimism for their friendship. Chloe’s own strained ties with her family are a nuanced look at the effects the death of a parent & spouse has beyond the immediate loss. The story in Blackwell reveals scarily recognizable parallels of peer, familial and academic pressure, bullying, mental health and depression, while Arcadia Bay looms large with its shadowy authority figures and power games. These many layers flow into each other incongruously, in the way great fiction does. The consequence-based story choices made throughout the game are thus incredibly powerful, and are made extremely difficult by the emotional implications. The narratives are truly brought to life by the characterization. None of the numerous characters come off as caricatures; they have distinct, complicated personalities, given weight by well-written dialogue. A strong example is Blackwell’s head of security, Chloe’s stepdad and bully, David Madsen. You see glimpses of his true, good intentions in places, which is revealed wholly towards the end of the game in a particularly poignant section. Another favourite is the introduction of the surprise villain, but that must be played to be truly grasped. My only gripe here was the unnecessary cussing, particularly by Max and Chloe, which tried too hard to be stereotypically millennial. That flaw aside, the voice acting in Life is Strange is some of the best I’ve encountered in gaming, and goes a long way in making the characters feel like actual people. Max sounds the part of a shy, confused teen to a T (besides the occasional breathy whispering) while other favourites include the psychotic Nathan, the reckless, yet deeply affectionate intonations of Chloe and the suave Mr. Jefferson. The captivating and incredibly-formed story of Life is Strange, however, would be rather empty without its gameplay elements. Dialogue choices form the core of the gameplay here; talking to the various people in the game world chips away at the intricate mysteries, while simultaneously revealing details about the characters themselves. The time-reversal mechanic is used effectively to open up further dialogue trees, to allow Max to steer the conversation in the direction she wants. Environmental interaction is also a critical element, divulging clues and information that often helps Max where people can’t. A few environmental puzzles are thrown in, but they don’t feel particularly necessary, and are more of a way to break up the pace than an actual contribution to gameplay. A key component in the later stages of the game, are Max’s photographs, which -without revealing too much- literally become a matter of life and death. The visuals of the game are reflective of the many phases the narrative goes through- optimistic, dark, disturbing, sentimental. It has a distinctive art style that is truly gorgeous in parts, thanks to the Unreal Engine powering it. The intricacies of the environment are fleshed out in exquisite detail, leading credence to the construction of a believable, real world. The people that populate the game are of special note; reflective of individual styles, and age, they are an accurate representation of the personas they are a facade for. It is unfortunate, then, that the facial animations for these characters is rather stilted and distracts from the experience. It is one flaw in the storytellling aspect that is otherwise flawless. Nevertheless, while Life is Strange’s visual component isn’t as revolutionary as its other parts, it certainly contributes immensely to the experience. The many components of Life is Strange tie together masterfully in one of my favourite sequences of the game. As a student is on the precipice of suicide, Max pushes her time-reversal powers to the edge to get close to the suicidal student, after which these powers fail her. You’re left with only your words to convince the girl that suicide isn’t the answer, using little clues you picked up through the game, and your previous choices having a direct impact on how receptive, or not, she is to your pleas. The very real possibility of this girl actually going through with her suicide unless you convince her otherwise lends an incredible weight to your conversation, and I was truly overwhelmed when I finally managed to get her to come down from the edge. Emotionally complex and powerful moments such as these are present throughout the game, and cause the player to share a deep connect with the characters. You’re invested in their lives, their trials, their little moments of victory; and the poignancy of these instances make for one of the most emotive and soul-stirring games I’ve ever had the fortune to play. And this is truly a game you must experience to understand. Life is Strange, then, is many things: heart-rending drama, crime thriller, fantastical fable and imaginative game. I had written a piece a while back on the power of story-driven games, and this is the absolute pinnacle of the same. As its threads all unravel, driven towards an emotionally devastating finale, it was evident that it had made for an incredibly satisfying playthrough. In the 18-odd hours I spent with Life is Strange, I experienced a journey through time, space and sentiment that affected me on a personal level. The elements of great storytelling are abundant in Life is Strange, culminating in a swirl of gut-wrenching emotion, rising slowly and accelerating at a heart-stopping pace towards the last couple of hours. Life is Strange is a stunning trip, one well worth taking.